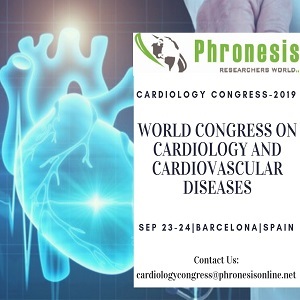 We cordially invites all the participants from all over the world to attend World Congress on Cardiology and Cardiovascular diseases will be held in Barcelona, Spain, during September 23-24, 2019. Cardiology Congress-2019 will feature up-to-date presentations on the Cardiology related research updates, evaluation and treatment of heart failure. New diagnostic tools, drugs, and devices will be reviewed along with their role in specific clinical situations. Integration of guidelines and clinical management will be highlighted. The program format includes interactive case based discussions, surgical and medical perspectives to ensure a lively and relevant enlightening opportunity for all participants. It is an event with evidence-based, guideline-driven update of the critical domains in cardiovascular research. In our two day meeting, we have allowed ample time for discussion, including small group networking sessions. At this gathering we provide a platform for the researchers, with new developments to come to the forefront. This is a platform for cardiologists, surgeons, internists, trainees, investigators, nurses, nurse practitioners, physician assistants and allied health care staff who participate in the care of patients with coronary, peripheral, and structural cardiovascular diseases to share your valuable innovations and suggestions to the next generations. The main theme of the conference is "A distinctive Outlook in Cardiology and Cardiovascular diseases research". With its strong emphasis on innovative approaches, the conference offers a chance for scientists and physicians working in different areas of drug development to learn of the new ideas that could help them advance their own research and forge new professional relationships and collaborations. Your Presence at Cardiology Congress-2019 will be a rewarding experience.